This is a fully revised and updated edition of the bestselling feline behaviour bible. Thanks to her regular appearances in the media and at veterinary conferences and humane organizations, most cat owners already recognize Pam Johnson-Bennett as the authority on all things feline. Over the past ten years, the award-winning author has continued to refine her work and techniques. From basic health care to more serious behavioural issues, from training cats to use a scratching post to avoiding litter box problems this newly revised edition of Think Like a Cat covers all of a cat owner's most pressing concerns-and solidifies its position as the topic leader for years to come. Edition Statement Revised, Updated, Expanded ed. 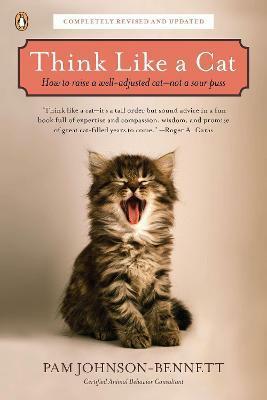 "Think like a cat--it's a tall order but sound advice in a fun book full of expertise and compassion, wisdom, and promise of great cat-filled years to come." --Roger A. Caras "An insightful and easy-to-follow tour of the land and language of felines. Even experienced owners will benefit from this book. She's the queen of cat behavior!" "If you have a cat, buy ths book. If you know someone who shares their home with a cat, buy it for them!" Pam Johnson-Bennett, author of Catwise, Cat vs Cat, and many other books, is one of the most popular and sought-after cat behavior experts in the world. She has a private cat-consulting practice in Nashville, appears on Animal Planet UK and Canada, and lectures on cat behavior at veterinary and animal welfare conferences around the world. She's been featured on CNN, Fox News Channel, CBS, ABC, NBC, Fox & Friends, Animal Planet Radio, and many more shows. Print profiles include Wall Street Journal, The New York Times, Real Simple, Better Homes & Gardens, Woman's World, Newsweek, Prevention, USA Today, Family Circle, Complete Woman, Newsday, Chicago Tribune, USA Weekend, Washington Post, and Parade. She was VP of the International Association of Animal Behavior Consultants and founded the IAABC Cat Division. Pam served on the American Humane Association's Advisory Board on Animal Behavior and Training. She lives in Nashville, TN.